Step up your fashion game with the elegant and original Flower Vine Pendant, which can be worn with any outfit. This stylish piece of jewelry can easily become your signature when you proudly wear it to the next social event. The full lead free pewter construction allows this item to be shaped into a stunning form. Painted gold lines have been curved to replicate an organic vine style. 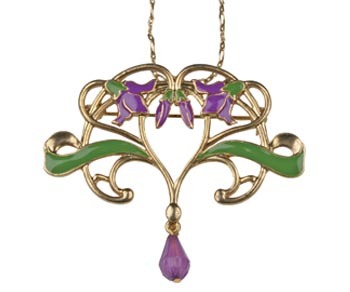 Several leaves and petals have been filled with purple and green inlays that enhance the nature theme. 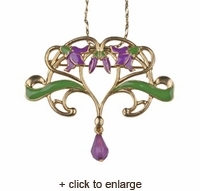 At the bottom, there is a dazzling purple accent bead that freely dangles. Allow the daring Flower Vine Pendant to become your style game changer today, and you will not be disappointed.